Restore backup data to your iPhone. Is there a better alternative to Coolmuster iPhone Backup Extractor? 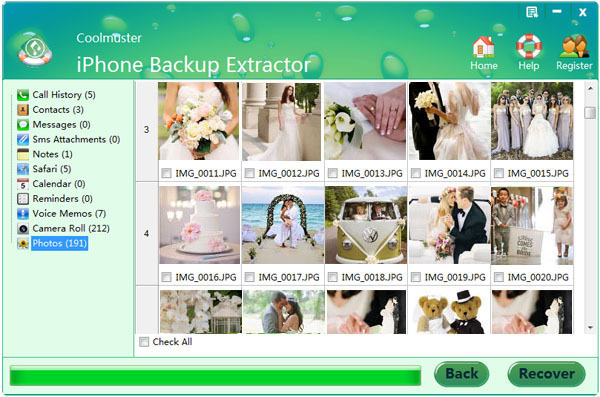 Is Coolmuster iPhone Backup Extractor really the best app in Backup category? Will Coolmuster iPhone Backup Extractor work good on macOS 10.13.4? With Coolmuster iPhone Backup Extractor, you can restore data from iTunes backups to your iDevice: support extracting up to 10 types of files for iPhone including Call History, Contacts, Messages, Notes, Safari, Camera Roll, Photos, and more. Text content can be recovered in HTML format and media contents can be recovered in original quality and format. No need of connecting your iDevices to Mac. 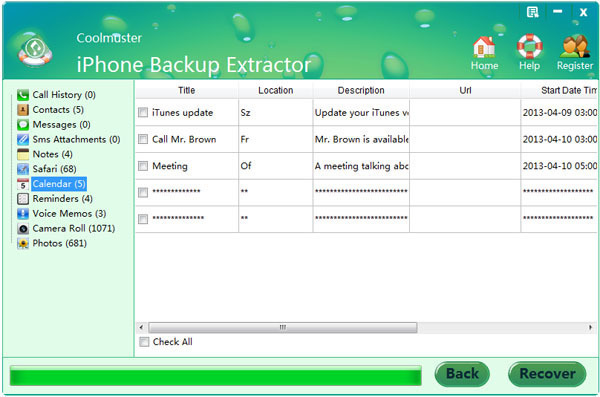 Coolmuster iPhone Backup Extractor needs a review. Be the first to review this app and get the discussion started! Coolmuster iPhone Backup Extractor needs a rating. Be the first to rate this app and get the discussion started! Preview Before Extraction - Restore a wrong file is an agonizing thing in the daily life. So Coolmuster take your trouble into consideration and release this new preview function to help you view any files you want before extracting. Text contents like call history can be previewed with phone number, date time, type and more. Make it easy for iPhone users to recover files from iTunes backup selectively. Media content in photo and camera roll is listed in thumbnails. Selective Recovery As You Like - Don't want to restore the whole iPhone backup file from iTunes? Don't worry, you can achieve it with one click. Selectively recover what you want by selecting them from the scan result. 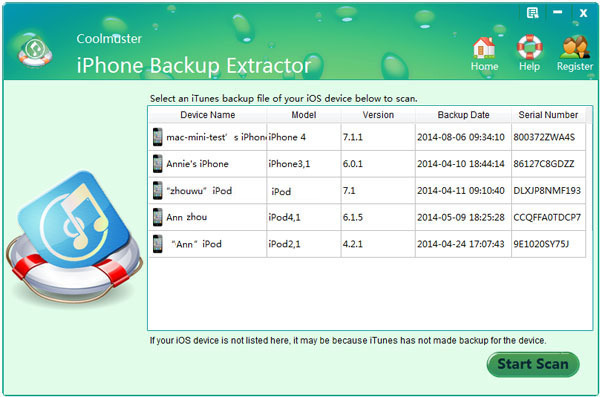 Not only a simple Mac iPhone Backup Extractor, but also a reliable iPad extractor and iPod backup extractor. User-Oriented Software - The original purpose of developing this software is to help users to find back something important from iTunes. So no matter the interface design, or function set, you can feel comfortable during the whole process. Restore lost iPhone data from iTunes backup without any quality losing. Scan iTunes backup files of your local disk automatically. Risk-free and read-only process which won't change any setting of your computer without permission. Supports all models of iPhone, including the latest iPhone 6/6 Plus, iPhone 5S/5C, iPhone 5, iPhone 4S, iPhone 4, iPhone 3GS, etc.